"Motor" - An American car magazine from the 1930s. Homepage. This page: A trade magazine from the 1930s written for garage owners and workers in the USA. "The Motor" magazine (later just "Motor") was, along with "The Autocar", one of the best-read car magazines in Britain during the 1930s. The publication of similar name shown on this page is of American origin though, the two copies here dating to 1935 and 1937. Whereas the British magazines were written with private motorists in mind for the most part, the US equivalent was aimed at a trade audience, for instance business owners who ran garages, and/or mechanics and other staff that worked in the automotive industry of the 1930s. The attractive and very colourful cover artwork, by "Robt. Robinson" in both cases, feature garage employees rather than cars themselves. The 1935 copy shows one chap at a "Bestone Automotive Radio" outlet eagerly listening to the horse racing results on a wireless, while a co-worker is hidden behind the desk, reading out into a microphone whatever results he thinks will get his colleague excited. 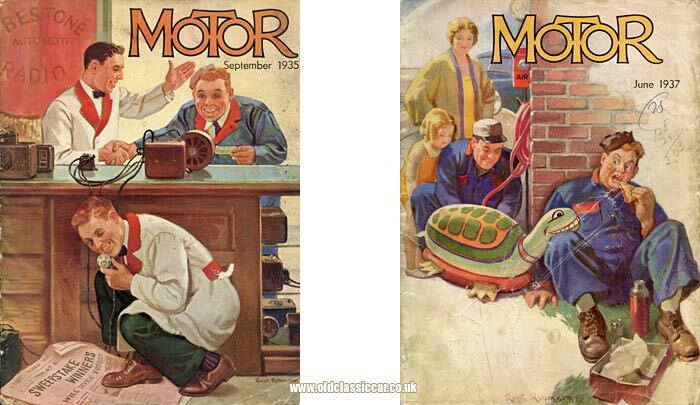 The other copy, dated June 1937, at least shows one person at work, inflating a child's toy turtle, much to the surprise of a second garage worker, who had sneaked around the corner for a cup of tea and a sandwich. A car, a gas pump and an air line can be seen behind the child's mother. For how long amusing cover illustrations were used I've not been able to find out, a copy I've seen from 1930 shows a mechanic and his boss presenting a lady customer with the pistons and rod from her car's engine, and it seems humorous illustrations continued to be used after the war, still penned by artist Robert B. Robinson of Pennsylvania. He produced covers for this magazine from 1926 through to 1952, but did the tradition carry on after this date? The advertisements to be found in this magazine are understandably geared to business readers. They sing the virtues of supplying companies such as Exide (car batteries), Francisco Auto Heater Mfg. Company (heaters for V8 Fords), Thompson (engine valves), Carter Carburetor Corporation, Tropic-Aire Inc. (heaters), and the Sealed Power Corporation (piston rings) to name just a few of those who feature in the first few pages. Many of the features concentrate on business matters, whether for the smaller garage or dealership owner, right through to the latest goings-on at the likes of Ford, Chevrolet and Cadillac, about whom customers expected motor industry personnel to be familiar with. Success stories can make for an interesting read, and several companies are profiled throughout both copies of this magazine. The 1935 copy has, for example, a two-page article on Bob's Air Mail Service Station in Los Angeles. A.V. "Bob" Spencer decided that to make his garage stand out from all the others, good service wouldn't necessarily be enough to lure in passers-by looking for gas, or to have work done on their car. 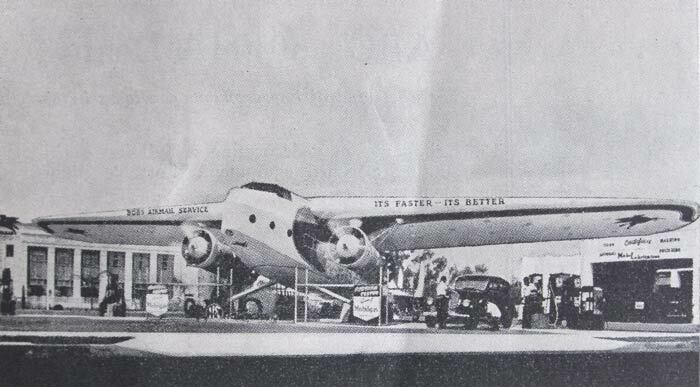 Therefore he invested in a 32-passenger "airplane", which he parked close to an intersection in March 1934, around which he organised his garage business. Painted white, and with a wingspan of 99 feet, it made for an eye-catching display, especially as the two engines' propellers were powered, and the whole aircraft illuminated at night. Once "hooked", he hoped that excellent customer service would lead to many of his customers becoming regulars. The identity of the aircraft isn't mentioned. His plan worked, in the first six months of trading his garage became the most successful retailer of the petroleum products it sold on the Pacific coast. In October of 1934 alone, they retailed 60,000 gallons of petrol. Whenever a car pulled in for gas, one uniformed attendant would see to the fuel. A second inspected all the tyres, including the spare, topping them up if necessary. A third meanwhile cleaned the front and rear screens, and checked the coolant level. Any faults, or suggested improvements (for example recommending a polish of the car's paintwork) were noted down. When the customer receives their change after paying for the fuel, they would also receive an "Airmail" service folder, in which these recommendations were listed. An invitation to take a closer look at the aircraft at a future date was also made, and a reminder given about the business' 24-hour emergency call-out service. No financial gain was made from these sales of fuel alone, but the aim was to encourage further repeat business and service from new customers that came along. Cards reminding their customers of work that would be required on their cars soon, were mailed out. If there was no reply after five cards had been dispatched, one of the station attendants would call by to find out why nothing had been heard (!). (After WW2 in a similar vein, Art Lacey bought himself an ex-USAF Boeing B17, flew it home (after crashing one in his first attempt) and propped that up in the air, and built a garage near Portland - the "Bomber Gas Station" around it. It survives to this day, although at the time of the writing the forward end of the cockpit had been removed for ongoing restoration). Another article casts light on the methods used by business McKenney and Adams, of Macon (Georgia), to earn local trade. They had uniformed workers walking down streets, performing free tyre checks, and even sweeping out the interiors of cars that had been left un-locked (!). A card with the recommended tyre pressures for each car attended to would then be left hanging on an exterior door mirror, inviting the owner to visit the service station. Robert S. Breyer's facility in Los Angeles offered a different service, in that they offered rolling-road, or "around-the-block" road tests, using their recently-installed "Automometer", or dynamometer. Cars were tested under load to mimic road conditions, while accurate readings could be taken of power output, fuel economy and general well-being. A report would then be given to the car's owner, with suggested servicing jobs listed. Once these tasks had been undertaken, the car would again be placed on the Automometer and the improvements noted, comparing the new results with those taken before the work had taken place. Here and there items relating to products or people involved with motoring in Britain appear. News of Sir Malcolm Campbell's next planned run at Utah, where he was hoping to break the 300 mph barrier in his "Bluebird" is relayed on page 62. Captain George Eyston would be accompanying Campbell with his own, twelve-cylinder 400bhp land speed record car, his target being the long distance speed records. A twelve mile circular course set out on the Bonneville salt flats would be the scene for his attempts also. "More attractive lines feature the second edition of the 10hp Ford made in England. The front of the car is equipped with a graceful and distinctive grille and bodies are roomier. In this connection it is worth noting that the present Ford hood and radiator design as used in the United States was previously introduced on the French and British Fords." "The engine in unchanged in its major details except that it is now mounted in rubber ... Steel spoke disc wheels have been adopted. There are three body models, two- and four-door sedans and a sport-touring car, with a price range of approximately $715 to $750." Old magazines like this are a real eye-opener to not just the cars that were available at the time, but also to the people that worked on them, and the problems they faced in the course of their trade. The articles and the advertisements, allied with the look and feel of these 1930's copies of Motor, add real context to preserved cars from that era, when they were new vehicles and being churned out in their thousands. The same can also be said for The American Automobile, although this example dates to the 1950s rather than the 1930s, but again was written for business readers rather than Joe Public. Return to the car magazines section, to read about other US and British motoring titles.